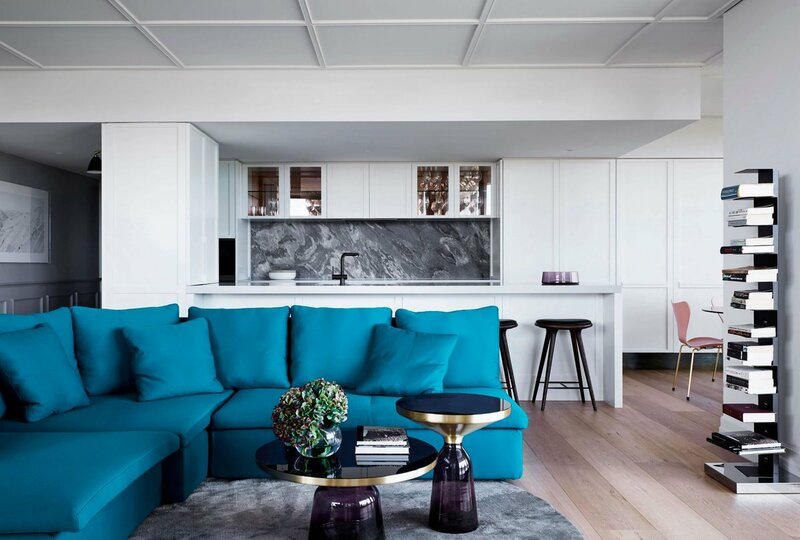 Situated in Melbourne, Australia, this inspiring apartment was completely redesigned in 2016 by Studio Tate. Studio Tate completed this comprehensive apartment renovation for a penthouse in the Melburnian complex, overlooking the Shrine of Remembrance and the botanical gardens. Our clients were an emptynester couple who had lived here for several years. Looking for a refreshed, opulent look and a space that could cater for entertaining kids and grandkids, we introduced the idea of ‘LA glamour’ – a sophisticated and bold concept that uses feature materials to evoke understated luxury with a vintage Hollywood vibe. As part of this project we also selected loose furniture and artworks for each room, accentuating the colour palettes, materials and textures of each space. Another more casual dining area is decorated with a smoked glass table, which contrasts with a set of limited edition pink Series 7 chairs with brass legs. In the master bedroom, we created a bespoke bedhead and frame with integrated side tables, above which is a brass wall lamp. A fluffy white chair sits below a round artwork in dark tones to add depth and interest. We’ve even been shopping with our client to pick out bed linen to coordinate with the design! The guest bedroom features chartreuse yellow accents, matched with a piece by Leila Jeffries. In the study, green is the dominant shade with two botanical oil paintings chosen to complement the Utrecht armchairs covered in white-flecked forest green upholstery, and a green stone and copper side table.